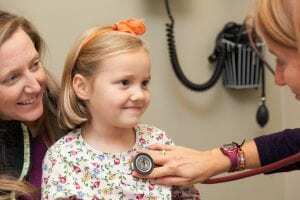 A little girl visits the doctor with her mother. Photo courtesy: Unity Care NW. Dr. Jennie McLaurin has seen it all. “I’ve seen everything that we immunize against, which is why I’m so pro-immunization,” says the Unity Care NW pediatrician. Pediatrician Jennie McLaurin has been practicing medicine for 30 years. Photo courtesy: Unity Care NW. McLaurin’s insight comes from her own experience. “Seeing a child who’s sick with one of those illnesses is sometimes what convinces parents to get their children immunized,” she says. A practicing pediatrician for 30 years, McLaurin has seen the world with and without immunizations. 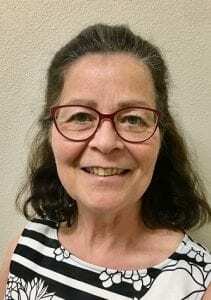 She has been at the bedside of countless dying infants and suffering children and, as a result, believes wholeheartedly in vaccinations for her patients and her own children, as well. Polio is a vicious, highly contagious disease that attacks its victims’ nervous systems, causing difficulty breathing, paralysis and even death. “Thirty years ago, when I went to India, I saw children with polio who were dragging a leg and were beggars,” says McLaurin. The impression stuck. In the early 1950s, more than 15,000 polio cases were reported every year in the United States. A polio vaccine was introduced in 1955 and, after being administered, the numbers declined tremendously. In the early 1960s, less than 100 cases were reported each year. Numbers continued to decline during the 1970s. Two little girls read in a check-up room. Photo courtesy: Unity Care NW. Today the United States has completely eradicated this disease that once caused constant fear among parents and children. Polio is still alive in certain parts of Asia and Africa, and it occasionally comes West with a traveler. But because of mass vaccination in the United States, it never regained traction here. “Herd immunity” is when a large number of people have immunity to a disease, effectively halting the contagion’s spread. It also helps protect the weak and vulnerable by cutting off the disease’s access. Scientific proof shows we all need to work together to eliminate these dangerous diseases. 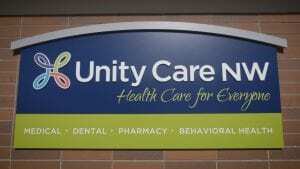 Unity Care NW focuses on whole patient wellness. Photo courtesy: Unity Care NW. The wonderful thing about modern medicine is that most of the particularly horrible viruses are now preventable. Vaccinations have made our children’s lives so much safer and happier. We just need to use them. “Now we’re a couple generations in and people haven’t seen it; they know that it’s mostly eradicated in the world and they’re not so worried about it,” says McLaurin. Three years ago, a large outbreak of measles occurred at Disneyland. Of the 125 reported cases, a large percentage of those infected were unvaccinated. The outbreak caused many parents to rethink their decisions. Two of the children infected were patients of McLaurin’s. After they recovered from the virus, their parents brought them in for immunizations. To talk to a medical provider about immunizations for your child, call Unity Care NW. For more information, visit Vaccine Myths Debunked.